LeBron James has been nothing if not enthusiastic about his role as the Kia K900’s official “luxury ambassador.” It was, after all, LeBron himself who reached out to Kia about being a spokesman for the vehicle, and ever since then, he’s been cranking out television commercials for the K900 with ruthless efficiency. Now it seems that the NBA All-star is taking it a step further by helping to design his own special “King James Edition” of the $54,500 luxury sedan. LeBron released the first teaser image (above), showing the vehicle’s unique badging, on February 10th. Now he’s released another teaser, this time a selfie showing off more of the car’s red and black color scheme. “THEY AIN’T READY!!!! #ThatCandyPaintMean #K900 #FitForAKing #StriveForGreatness,” he wrote on the Facebook post teasing the upcoming release. 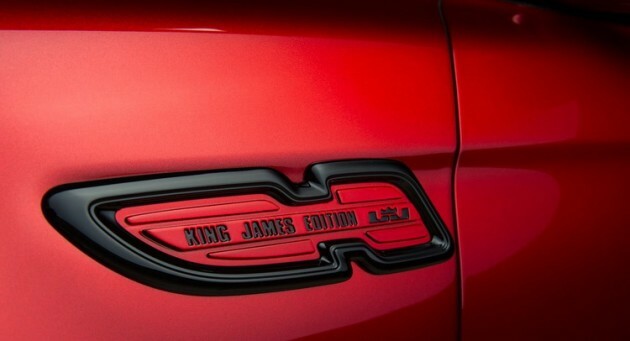 Still no date on when the Kia K900 King James Edition will be revealed, but seeing “THEY AIN’T READY” in all caps does not make the unveiling seem very imminent.